Twisted Sister will play on November 14th at Via Funchal and promises to reach the 'Sold Out' ticket status. Tickets still available but it will not take too long since will be their only presentation in Brazil. The band gets excited for coming to Brazil for the first time. "Max Cavalera is my friend and he always tells me about Brazil. I've seen several DVDs of concerts around here and I could fell the crowd's enthusiasm," says lead singer Dee Snider to the Destak newspaper. Last April, the Kiss brought further than 30 thousand people to their concert. Twisted Sister will certainly do the same. One of its striking features is the make up, but two reasons says that this can be one of the last opportunities to see the group with the painted face. "When we got back together, we only wanted to do a sort of revival. But the thing has never stopped. We do not want to be like Kiss, affirm Snider. Another reason is that, recently, a festival in Holland, we played without makeup and the local press enjoyed and said we did the best event's presentation. It is time to understand that we are too good without makeup, "he says. 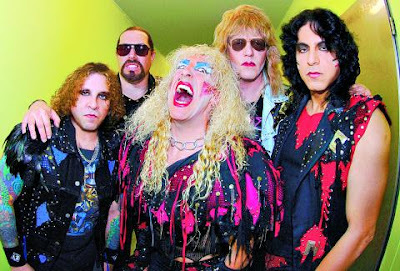 Known as the classic "We're Not Gonna Take it", the Twisted Sister came up on 80's. When: November 14th, at 10pm. How much: R$ 140 to R$ 250.